Ojibway Family Lodge is a rustic resort located on Devil’s Island in Lake Temagami – an unspoiled lake, 300 miles from Toronto, with 3,000 miles of shoreline and 1,500 islands. Imagine a wilderness shielded by ancient granite and dense with giant northern white and red pine, birch and cedar. Loons call from the lake. Blueberries and ferns are at your feet. There are no roads to Ojibway; transportation to the island is by boat or float plane. When you arrive, you will be struck by the enormous silence of the magnificent forest. Nestled in the Northwest Arm of Lake Temagami, Ojibway features a relaxing atmosphere, relics of the old North, and warm hospitality. Lodging in camp style cabins, with amenities, allow you to relish in our Island's rustic elegance. Delicious meals are served family style in a dining room over the lake with breathtaking views. A cozy common lodge provides social space for casual gatherings, board games, and cards. Ojibway Lodge is completely off-the-grid, operating independently of all traditional public utility services. Electricity on the island is powered by generators in common spaces. To be fully immersed in the quiet and relaxation of nature, Ojibway does not have televisions, radios, computers, or telephones in cabins and common spaces. The dining room and common lodge do have recharging capabilities. Though there is no phone service, the island does have internet connectivity. Ojibway Lodge opened in 1923 on the North end of Devil's Island. 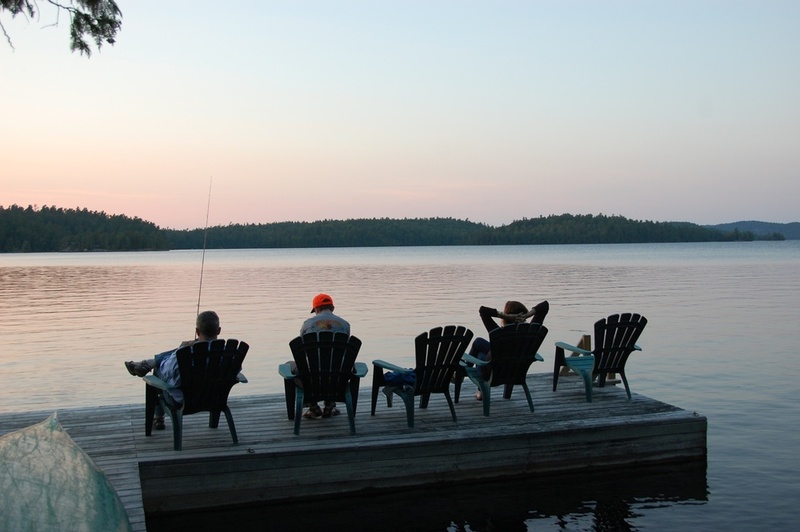 Since its inception, the lodge has been owned and operated by the Directors of Keewaydin, a summer camp for boys and girls, located on the South end of Devil's Island. Family and friends of Keewaydin campers have long stayed at Ojibway to participate in the camp celebrations during the middle and end of the summer season. Though Ojibway Lodge still has an integral relationship with Keewaydin Temagami, the comforts and opportunities for guests at Ojibway have expanded. Ojibway offers canoe trips for families, artist retreats in different mediums, theme dinners for Temagami Islanders, a spectacular location for destination weddings and celebrations, as well as a serene place for rest and relaxation. Tanya McCubbin assumed the role of manager in 2012, following the retirement of Sandy Chivers, who ran Ojibway for 28 summers. Tanya arrived on Devil’s Island in 1995 working in the Keewaydin Kitchen and returned in 2004 and every year since, serving as Assistant Cook, Head Cook and Business Manager. Her family joins her on the island every summer: sons Malcolm and Hudson (who are Keewaydin campers) and husband Rob, a teacher, and an invaluable do-it-all guy at Keewaydin. During the rest of the year, the McCubbin family resides in North Bay, Ontario.